In this photo taken during a government-organized tour, Syrian soldiers celebrate after they regained control of the district of Midan, in the southern part of Damascus, Syria, Friday, (Photo: AP). As darkness descended over Damascus last Saturday, few of its 1.7 million residents could have had any inkling that a decisive battle to wrest the city from the grasp of President Bashar al-Assad was about to begin. Insurgents gave the operation a name that reflected their hopes of a successful surprise attack on a city long regarded as an impregnable fortress for the Assad family: "Damascus Volcano and Syrian Earthquake". "There is no going back," Colonel Qassem Saadeddine, a spokesman for the joint command of the Free Syrian Army (FSA), told Reuters after the fighting had broken out. "We have started the operation to liberate Damascus." The operation, still under way, has come closer to toppling Assad than anything else in the 16-month uprising against his rule. By nightfall on Friday, six days after it began, rebels had seized control of border crossings and were battling loyalist troops on the streets of Damascus. The attempt to seize the lair of a man whose father was known as "The Lion of Damascus" had been long in the planning, Saadeddine said. It involved 2,500 fighters who had infiltrated the ancient city's suburbs a week earlier, he said. Insurgents were especially redeployed from other parts of the country for the task, another FSA officer said separately. The rebels struck first in the city's southern Hajar al-Aswad district, engaging in sustained battles with government troops who must have wondered what had hit them. The following day, July 15, the scale of the rebels' ambition became clear. That day, a Sunday, a powerful blast tore through a bus in Damascus carrying security forces personnel, wounding many, and fighting spread to three other city districts. Residents sympathetic to the insurgents burned tyres to distract government troops. Government armoured vehicles poured into southern Damascus amid reports that the road to the airport had been closed. Residents of one of the world's oldest continuously inhabited cities corroborated those accounts described the fighting as the fiercest to touch the capital yet since the uprising began in provincial towns 16 months ago. Assad had - until then - largely succeeded in shielding his capital and its residents from the extreme violence that has convulsed the rest of the country while he battled to maintain his family's 42-year grip on power. Even as his tanks and artillery laid waste to parts of other cities, traffic in Damascus circulated, shops and markets kept open, and students continued to study. But as black smoke rose above Damascus last Sunday and the clatter of machinegun fire rang out - interspersed with the sound of explosions - that illusion of normality was shattered. On day two of the operation, residents of the central district of Midan said their area had become a war zone with snipers deployed on rooftops and heavy fighting between rebels and government troops. The supply of electricity and water to some districts was cut. Serious clashes broke out in the districts of Zahera and Tadamon. As violence escalated, activists said tanks were in action on the city's streets, a move analysts interpreted as a sign the government was beginning to panic. Using classic guerrilla warfare tactics, insurgents sheltered in the city's narrow alleys in the knowledge that armoured vehicles and tanks would be unable to follow. Syrian state TV made little reference to what was unfolding, saying only that security forces were chasing "terrorist groups" that had fled to parts of Damascus. Video footage uploaded by opposition activists showed men in jeans crouching in sandbagged Damascus alleyways, firing rocket-propelled grenades and machineguns. At that point, on Monday, the rebels said they were surrounded by government troops. The rebels say they have adapted their tactics, becoming more organised and mobile, operating in smaller groups so as to present a smaller target for government forces. They have also turned increasingly to using homemade bombs or improvised explosive devices (IEDs), they have said. Though foreign backers keep them supplied with a steady stream of small arms smuggled into Syria, it remains unclear how much direction or support the rebels are receiving, if any, from foreign intelligence services. On the third day of the offensive, July 17, helicopter gunships were reported to have been pressed into action and the rebels said they had shot down one army helicopter. Clashes of such intensity so close to Assad's seat of power showed his grip on power was weakening, anti-government activists said. "When you turn your guns against the heart of Damascus, on Midan, you have lost the city," said Imad Moaz, a Damascus-based activist. Video footage showed the charred facades of shops and buildings. Israeli military intelligence said Assad hurriedly redeployed troops serving near the Israeli border to Damascus in order to bolster his firepower. The fourth day of the battle is the one that changed the course of the war. Battles flared in the morning within sight of Assad's presidential palace, an imposing structure that sits on a sandstone hill overlooking the city. Assad's most trusted lieutenants, led by his brother-in-law Assef Shawkat, were holding a crisis meeting inside a security headquarters when a bomb blast tore through the room. Shawkat was killed, as was the defence minister and another top general. The intelligence chief would die of wounds two days later, and the interior minister was also hurt. Jubilant, the rebels claimed responsibility, boasting that they had pulled off what they called "a turning point in Syria's history", hailing the attack as "the beginning of the end". It was unclear whether the bomb was delivered by a suicide bomber or whether it had been remotely detonated in the same way that Claus von Stauffenberg had tried and failed to kill Adolf Hitler in 1944. But the attack - taking out the top layer of Assad's military planners right in the heart of Damascus - gave a huge boost to the rebels while delivering a psychologically devastating blow to the government. Shell-shocked or lost for words, Assad did not appear on state TV until the following day. He has yet to make any pronouncement on the attack, leaving it to his former army chief-of-staff to vow swift retaliation. His unproven whereabouts became the subject of rumour, with rebels saying he had left the capital for the coast. One Western diplomat says it is understood that after the attack the Syrian president called the head of a UN peace monitor team, General Robert Mood, promising to implement a UN peace plan if the West could get rebels to stop their attacks. Mood and UN envoy Kofi Annan were not available to comment. The authorities promised the rebels they would strike back hard, saying they would "cut off every hand that harms the security of the homeland". Syrian troops began turning their anti-aircraft guns on rebels in residential areas pointing the barrels at buildings instead of skywards. Helicopters and artillery fired on Damascus throughout the day. Blasts also rocked an area close to the base of a feared military unit led by Assad's brother, Maher, while a police station in the Hajar al-Aswad district went up in flames. Syrian Information Minister Omran Zoabi called the battle for Damascus "the decisive battle in all of Syria" - a comment echoed by Sergei Lavrov, the foreign minister of Russia, Assad's main protector on the world stage. For the first time, state TV showed government troops exchanging fire with rebels in central Damascus. "This is the volcano we talked about, we have just started," said Saadeddine, the FSA spokesman. On day five, helicopter gunships pounded rebel positions. Artillery batteries nestled in the mountains overlooking Damascus rained down shells on two city districts. Rebels torched and looted the Damascus Province Police headquarters, a huge building. Residents spoke of corpses in the streets. Scared to venture out, many residents said they had locked themselves inside their own homes for their own safety, while most shopkeepers shuttered their businesses. Ordinary citizens appeared to have deserted the city's once bustling streets. "Everyone in the neighbourhood is arming themselves," said one resident near the Midan district. "Some with machineguns, some with shotguns. Some even just with knives," the resident added. Fighting flared near the Syrian government's headquarters - a vast Soviet-style building as well as near the prime minister's office. Far from Damascus, rebels seized border checkpoints with Turkey and Iraq, the first time they had held control of Syrian frontiers. On Friday, the sixth day of the rebels' attempt to "liberate" Damascus and the first day of the Islamic holy month of Ramadan, the insurgents suffered a setback. Under heavy bombardment, they were forced to withdraw from the central district of Midan. "It is a tactical withdrawal. We are still in Damascus," Abu Omar, a rebel commander, said by telephone. Elsewhere in the city, rebels set fire to a military barracks after a two-day siege. 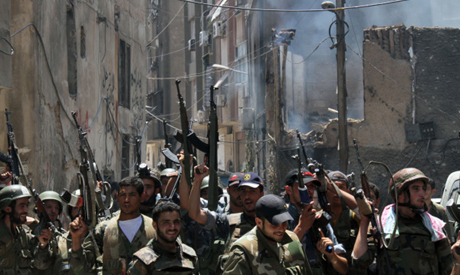 Opposition sources said the building had been used as a training ground for feared shabbiha militiamen loyal to Assad. In a further sign that the authorities' control was becoming increasingly tenuous, UN officials said they had heard reports that the city's banks were running out of money. State TV showed the bodies of about 20 men in T-shirts and jeans with weapons lying at their sides. It described them as members of the "so-called Free Army" killed in battle. Trying to show that the authorities were still in control, state TV also broadcast live footage of central roads and districts. But the traffic of the cramped Middle Eastern city was missing; only a few cars were moving along its boulevards. As the temperature rose to above 40 degrees Celsius (104 degrees Fahrenheit), power in many parts of the capital remained cut off, compounding people's misery. Many residents have already fled, with tens of thousands of people reported to be pouring into neighbouring Lebanon. At the hilly Masnaa border crossing on the Lebanese side, Damascenes, many of them wealthy families driving their own air-conditioned cars, could be spotted making their way past border control. The FSA still may need more defections from the army to gain the expertise and weaponry to achieve final victory. President Barack Obama's administration has been drawing up contingency plans for if and when Assad falls. The New York Times said Washington was talking to Israel about the possibility of securing Assad's chemical weapons - one of the largest stockpiles of its kind in the world. Like a wounded lion, Assad could still mount a robust response to the rebels' most audacious attack on his powerbase.